It’s been both an extraordinary and challenging year for journalism — to say the least. On one hand, the profession has never been under greater attack. Constant accusations of fake news, anti-media sentiment coming from many of the world’s politicians and a seemingly overwhelming supply of competing content has made it much more difficult for professional journalists and influencers to be heard. As tested as the industry has been, one outcome from all the turmoil is that journalists need reliable public relations partners — perhaps more than ever before. According to Cision’s 2018 global State of the Media survey, in which the company surveyed 1,355 journalists from across six countries on their perception of the media and communications industries, working with trusted professionals who can provide accurate, newsworthy information is a must. Fake news is a big deal and for good reason: It’s making people much more suspicious of all content they consume. Globally, 56 percent of respondants said that fake news is making readers more skeptical than ever about what they read and see. Trust is another issue, with 71 percent saying they think the public has lost trust in journalists. That’s down from 91 percent last year, but it’s still a significant number. Social media is also making the job of a journalist more complicated, as some worry that social networks and search engines are causing audiences to bypass traditional media. What’s the implication for brands and communications professionals? It means that being a trusted source and reliable partner is more vital now than ever. While journalists can get story ideas from anywhere, they still say their most valuable and trusted piece of PR content is the traditional press release. Most are happy to work with public relations professionals, provided they’re giving them information that’s accurate, newsworthy, and that can be used to enhance their coverage. It’s no secret the journalism industry is undergoing some profound changes. Newsrooms are either shrinking or changing the focus of their coverage. The survey data helped elucidate the scope of those changes. Out of all the issues the industry is facing, 28 percent said staffing and resources were the biggest challenges in journalism over the last 12 months. Social networks and search engines bypassing traditional media was a close second at 25 percent. Ongoing conversations on fake news, blurred lines between editorial and advertising, and issues around freedom of the press rounded out the list of challenges. The proliferation of fake news, typically created by “troll farms” and those on the extreme ends of the political spectrum, was the second most pressing challenge over the last 12 months – still a major concern for many journalists. More than half said “fake news” is making readers more skeptical about the content they read, including news produced by real reporters, while 46 percent are still unsure of how these untrue stories will impact their organization in the future. There may be a bright side to the fake news phenomenon: 21 percent of respondents said that it’s increasing the importance of journalistic standards, while 9 percent said that it’s improving the popularity of trusted and established media brands. How are journalists dealing with the industry’s biggest challenges? With so much attention on news media these days, being first to publish, whether on social media or their outlet’s website, is no longer the priority for most journalists. Like we saw last year, ensuring that content is 100 percent accurate is paramount, with 75 percent of global respondents saying getting things right is most important to their news organization. Only 10 percent said the same about being first to publish, down from 13 percent in 2017. Globally, 75 percent of media say that ensuring content is 100 percent accurate is the most important for their org. Being accurate has always been important to journalists but emphasizing that aim for accuracy may help the media grow its audience. When we asked journalists if the public had lost or gained trust in the media over the last year, 71 percent said people had lost trust, with only 5 percent saying the opposite. While that’s still a troubling number, it is down from 91 percent in last year’s survey. Why the decline? The constant attacks on the media industry have made people pay more attention to what journalists do and the value they provide. Couple that with the publication of several ground-breaking stories and more people now realize that the media does, in fact, produce honest and important work. The public is looking to traditionally trusted sources to provide relevant and factual coverage of current events. One issue that reiterated the importance of journalism was #MeToo and #TimesUp, movements that started after reporters broke stories on sexual harassment in Hollywood and within journalism’s own ranks. We wanted to know if these movements help or hurt the perception of journalism, since many of the issues of harassment happened with media personalities. The media was split, with 36 percent saying it strongly enforces journalism’s role, 35 percent saying it didn’t make a difference, and 29 percent saying it hurt journalism’s image. Social Algorithm Updates Social media has been a major media disruptor for years, but it’s still something many journalists grapple with as part of their day-to-day duties. When asked what new technology will change the way journalists work the most, 34 percent said new social media algorithms. Specifically, they called out Facebook’s recent news feed and algorithm updates, saying they will have the biggest impact on their jobs. More than a quarter said that better and cheaper video production technology would influence their work, while 21 percent think artificial intelligence and machine learning improve the way they analyze traffic and performance data and predict readership trends. Smart Devices & Voice Technology As for other technologies, the survey found that home assistants, such as Amazon Alexa and Google Home, may be incorporated into the content development process in the future. Up to 38 percent of respondents say these devices will be impactful, but aren’t yet a near-term priority. Another 32 percent said these devices wouldn’t have a major impact on media consumption, while 22 percent said they would increase people’s focus on new content delivery channels. A small number, 8 percent, said that this technology would force a complete rethink of publishing as we know it. The journalism industry may be experiencing plenty of change, but the State of the Media survey found that its dependence on public relations professionals hasn’t wavered. We asked respondents whether their relationships with PR professionals are more or less valuable today. In response, 70 percent said their relationships remained neutral, while 20 percent said it’s more valuable. When it comes to what journalists want from their PR contacts, 63 percent said news announcements and press releases, indicating that most reporters want to continue interacting with their PR professionals in the same way they have been historically. However, 22 percent reported that original research on trends and market data was also important to them, offering a new opportunity for PR and comms pros to be a source. 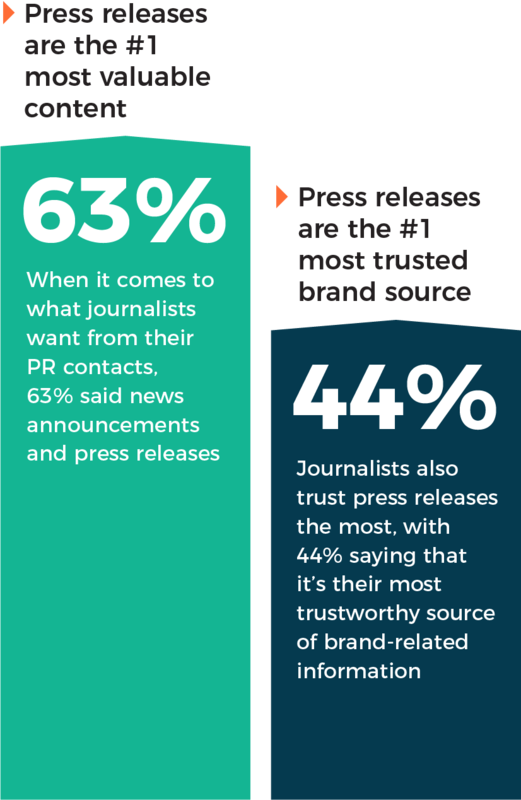 Journalists also trust press releases the most, with 44 percent saying that it’s their most trustworthy source of brand-related information. Only 30 percent said the same about a company spokesperson – clearly there is work to be done when it comes to the spokespeople PR professionals provide – while 20 percent said they trust the company’s website most. Despite how much time journalists spend on social media, just three percent said they trust blog and social media channels. Journalists continue to love the press release. For three years in a row, media professionals have ranked press releases and news announcements as the most valuable type content they receive from their PR contacts. They’ve also once again chosen the press release as their most trusted brand source. This is nearly universal, with journalists from around the world citing press releases as their most trusted source of company information. With journalists able to get news from a variety of sources these days, PR professionals can’t rest on their laurels. If they don’t give the media what they want, journalists could quickly turn against the release and find another way to get the information they need. 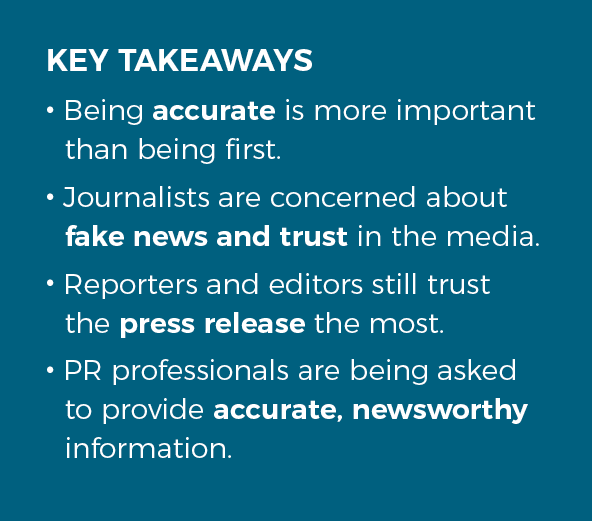 Given the low levels of trust in media today, and concerns about how fake news might impact the industry going forward, being a trustworthy partner to journalists is paramount. But how can brands help build up that trust? One place to start is by providing media professionals relevant and honest research and information via press releases, story pitches and by arming brand spokespeople, including CEOs, with real and interesting stories to tell. Continuing to make earned media a priority is still important, too. Using owned channels, like a website or company blog, can provide some context and useful information, but it’s not useful for reporting a story. In fact, only three percent of global respondents said that a company blog is a trustworthy source of brand information for their stories. Getting someone to speak to a journalist directly, versus just pointing them to your site, is still important today. But whatever your media outreach plan involves – whether it’s a blog post, a press release or a CEO giving an interview – PR pros must put forward material that’s not marketing jargon, that can explain clearly how something works, and why it’s relevant to journalists. Even with all the changes in media formats (social explosion, sites, blogs, etc.) the tried and true press release still reigns, followed closely by company spokespeople. It seems “the more things change, the more they stay the same”. The data shows that the media continues to fall back on traditional, trusted sources of brand content. If there’s one thing that PR professionals can do to help journalists do their jobs better, it’s ensure that any press releases they do send out have a clearly stated news hook. That was something 45 percent of respondents said when asked how press releases can be more efficient. Also, write conversationally — 27 percent indicated that they dislike press releases that feel templated and include jargon. More quotes and multimedia elements would help, too. As strong as the PR-journalist rapport may be, there are ways to improve the relationship. According to the survey, 28 percent of respondents felt that PR professionals can do a better job of researching and understanding journalists and their outlets before pitching, while 24 percent said they’d like pitches to be more tailored to their beat. Another 27 percent noted that PR professionals should have data and expert sources ready to go when reporters need them. Only 15 percent said that their number one request from PR professionals was less spam. Journalism is dealing with several challenges these days, but the PR industry can help news outlets navigate these choppy waters. No matter what happens in the industry, eye-catching, fact-based storytelling is still paramount. The PR professionals who can help reporters and editors with their work — by providing accurate, information-rich press releases, and by giving journalists access to sources — will be the ones who will succeed the most. For the third year in a row, journalists ask that you to research them, understand who they are and what they cover before pitching them, ranking this their top request of PR pros. They also want brands to provide original data and expert sources in a timely manner. Have a solid PR pitching and press release strategy, along with a stable of spokesepeople ready upon request is a good best practice. Global respondents rated their PR professionals at 3.38 out of 5 stars, between neutral and satisfied. Cision conducted its 2018 State of the Media Survey between February 1st and February 28th of this year. Surveys were emailed to Cision Media Database members, and are vetted by the company’s media research team to verify their positions as media professionals, influencers and bloggers. The survey was also available to media professionals in the PR Newswire for Journalists database. This year’s survey collected 1,355 total responses from across the media spectrum. 842 respondents were from the U.S., 197 were from Canada, 43 from the UK, 43 from France, 50 from Germany and 180 from Sweden. Globally, 651 are in print (newspaper/magazine), 208 work in broadcast (TV/radio/podcast), 267 work for an online-only news outlet, 194 identified as individuals/personal bloggers/freelancers, and 35 work for a social media platform. The survey language was translated and localized for each country and market and then the results were tallied together to form this global report.